Sanofi Genzyme Korea said that the Ministry of Food and Drug safety has expanded dosage and capacity for the additional course of therapy for Lemtrada, a multiple sclerosis treatment (ingredient: alemtuzumab). 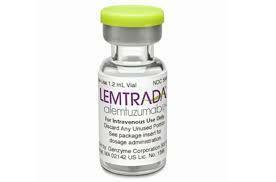 Lemtrada is a highly efficacious monoclonal antibody therapy used in the treatment of patients with active recurrence-mitigating multiple sclerosis defined by clinical or imaging characteristics. The company conducted a direct comparative clinical trial with interferon beta and confirmed annual recurrence rates and improved disability effects. Initial treatment for Lemtrada includes a 12 mg/day administration for the first five consecutive days (total dose 60 mg), followed by 12 mg/day for three straight days after 12 months from the first treatment period (total dose 36 mg). With the expanded dosage and capacity, patients with clinical or radiologically confirmed multiple sclerosis after the completion of the second course of treatment with Lemtrada can receive third or fourth additional treatments. For patients requiring additional treatment, the ministry approved a 12 mg/day dose (36 mg total dose) for three consecutive days after 12 months of the last therapy. "We will do our best to reduce the burden and suffering of patients with multiple sclerosis through efforts to acquire expanded insurance coverage for the additional treatment course approved for Lemtrada,” Sanofi Genzyme Korea General Manager Christine Park said.